Helmuth Hübener, the youngest opponent to the Third Reich, died living these principles. A member of The Church of Jesus Christ of Latter-day Saints, he was raised by his adoptive father Hugo, who was a Nazi sympathizer. Like all youth at the time, he joined the Hitler Youth when he came of age and had no problems with the Nazi regime. This changed for him after Kristallnacht. Many of his friends and classmates participated in persecuting the Jews and destroying their homes and businesses. This did not settle well with young Helmuth, and from that night of broken glass and the screams of the terrified, he placed himself in opposition to the Third Reich. He participated in debates at the local LDS church, where his bishop (a member of the Nazi party) had banned Jews from attending religious meetings. His resistance against this principle of discrimination was such that the bishop, without consulting higher members of the Church, excommunicated him from the Church. If that was meant to discourage Helmuth, it didn’t work. Determined to pursue virtue and with a hope to endure all things, Helmuth began a vigorous campaign against the Third Reich. He and his friends listened to BBC radio, even though it was treasonous to do so. Inspired by the ideas that he heard, they started to write leaflets dedicated to opposing the Nazi movement. This opposition did not go unnoticed. On February 5th, 1942, Helmuth and his friends were turned in to the Gestapo by his employer, who had caught them trying to distribute their pamphlets to French prisoners of war. 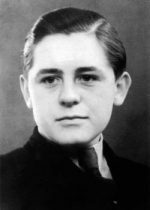 On August 11, 1942, Helmuth Hübener, age 17, was sentenced to death by the Volksgerichtshof. Helmuth was executed two months later by guillotine at Plötzensee Prison. His friends were also sentenced, but only given 10 years apiece. Helmuth Hübener’s sacrifice did not go unnoticed. Four years after his death, he was posthumously reinstated into the Church after his story reached the ears of Max Zimmer, a new mission president at the time. He was given the office of an elder, as well as rebaptized and endowed. His life has been the subject of several media adaptions, including novels, plays and movies. It would have been easy for Helmuth to remain cowed in the midst of so many people, including members of his own faith, who were too afraid to fight for the things which were “virtuous, lovely and of good report or praiseworthy.” Helmuth’s sacrifice deserves recognition for not only what he did to stand up and speak out, but for the example he set to seek the good things in all circumstances in his life. Helmuth is an inspiration to us all. Especially in our day of wavering standards. Many betray our God by remaining quiet. We shall reap the whirlwind if we choose the easy path of silence.We are in a day when we too must stand for the right, regardless of the consequence. We are now in a day when others will mock us and attempt to silence us because we speak the truth. God give us the strength !